Scott Elmquist Get the most bang for your buck at lunchtime. 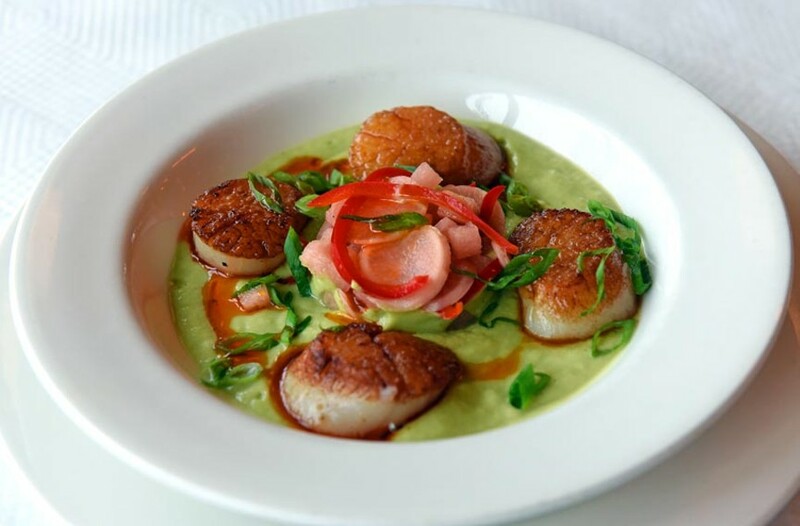 Can Can’s plat du jour one Tuesday included seared scallops over cucumber and avocado gazpacho. When your finances say no way to dinnertime prices, look to lunch to stretch your gourmet dollar and dish up inventive food for a fraction of nighttime prices. Food warriors would be hard-pressed to find a more intriguing high-end lunch than Can Can Brasserie's daily plat du jour for $14. A recent Tuesday special offered seared scallops over cucumber and avocado gazpacho with paper-thin radish slices and paprika oil, every bite a masterfully orchestrated symphony of vivid hues, contrasting textures and distinctive flavors, while a Thursday special of fried skate wing frite proves to be as good as any served in this town, as are the mountain of accompanying fries. And fear not, meat lovers, crispy pork cutlet with ratatouille and a sunny side up egg awaits the financially strapped on Fridays. Would it be too corny to say that lunch is the new dinner?